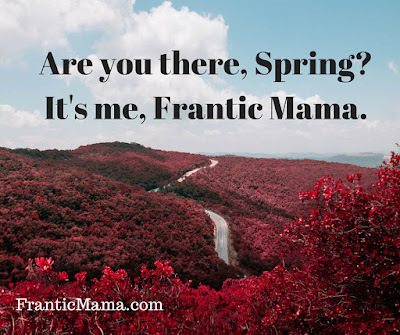 Frantic Mama: Could it be that Spring has arrived? Minnesotans really earn our spring. I don't know if anyone celebrates spring like we do here in Minnesota. Well, maybe people in Maine, or Montana, or North Dakota. Other states with long, cold, dark winters. 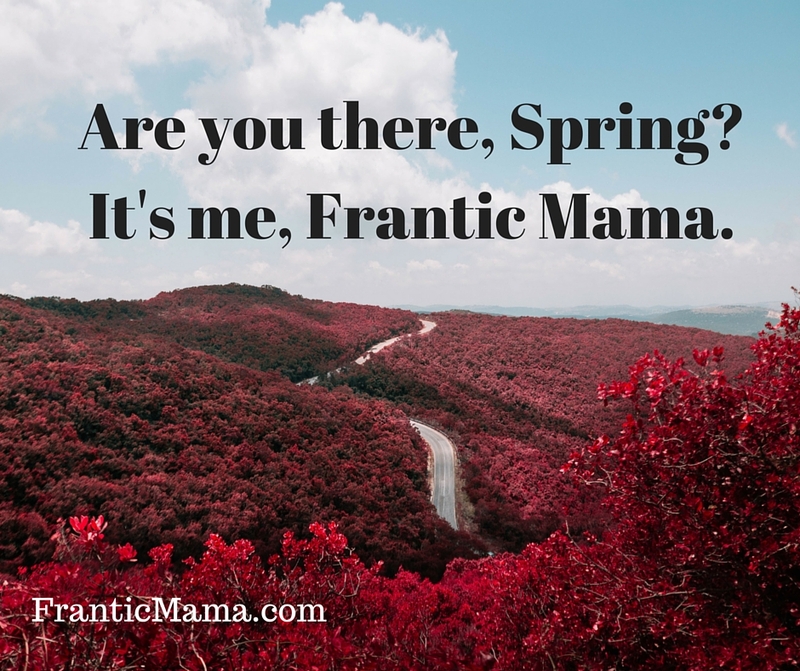 The sun is out today, and despite the fact that my daughter and I are both suffering from God-awful sinus infections, I'm looking forward to my favorite springtime activities. Going to the park isn't hellish anymore. Once you are past the baby and toddler phase (all hail! ), you can go to the park in warm weather and your kids will actually run and play and get their energy out. You might have to do a little damage control, but for the most part, let them be free (and try to sit and rest on a bench for 5 minutes!). Say goodbye to the hefty jackets/coats/mittens. Leaving the house without the extra 10 minutes it takes to get snow pants, boots, mittens, hats, etc., is a total luxury. I relish it. The days are longer. Sunlight! Oh dear, dear sunlight. How I've missed you. Walks. Walks with my kids are not like what you see on t.v. and in magazines with mothers blissfully pushing strollers of quiet, calm children while she sips a giant latte. Our walks are kind of ridiculous because I either attempt to put my kids in our double stroller which usually ends in a standstill because they decide they're too big (and they probably are), so they choose to "walk" with me, which really means stopping and starting and going backwards and running ahead and so on and so forth. We probably cover about .2 miles in all. But all in all, it's still nice to be able to take walks without getting frostbite. Date Nights: Is there anything more blissful than sitting on a breezy patio in the evening with your husband and sipping a cocktail while the kids are at home with a sitter for a couple of hours? I think not. What about you? What simple spring joys are you anticipating? By the way, if you are interested in checking out my rural/country life/horse photography site, it's up and running at JAEquinePhotography.com. I love your snow but I am glad spring has made its way to you! Sunshine brings so much cheer after grey days. I know that about walks with kids!! And your date nights sound glorious. Spring 's already left me, rather fleeting, it is all unrelenting sun now. And then we have rains that go on and on for days. Have fun! lots and lots of outdoorsy fun!! !